This sink is awesome!!!! I was so worried about ordering a stainless steel sink as I have friends who have them and they have a weird smell......like rusting metal. We installed this sink almost a year ago and I absolutely love it. The size is wonderful for a family of five meaning it is deep so you don't see the dishes that are put in there during the day and the zero radius is such a smart look. I paired it with an industrial look single faucet and couldn't be happier. A new landmark in overmount design. The deep, square bowls and zero-radius corners of the Tirana series will easily drop into the trendiest of kitchens. Each Tirana sink comes pre-drilled with a single hole for faucet installation. We purchased this Ruvati 16-gauge Stainless sink to replace our contractor grade kitchen sink. When it arrived, the sink came packaged with foam all around it and the sink was even in a nice soft cloth sack to protect it from scratches. After using the sink for close to a year now I can say it is worth the money. The small side is perfect for stacking up our dirty dishes, and the big side is great for washing and scrubbing large items; even our 12" skillets! The only downfall to this sink is not on part of Ruvati (from what we can tell). 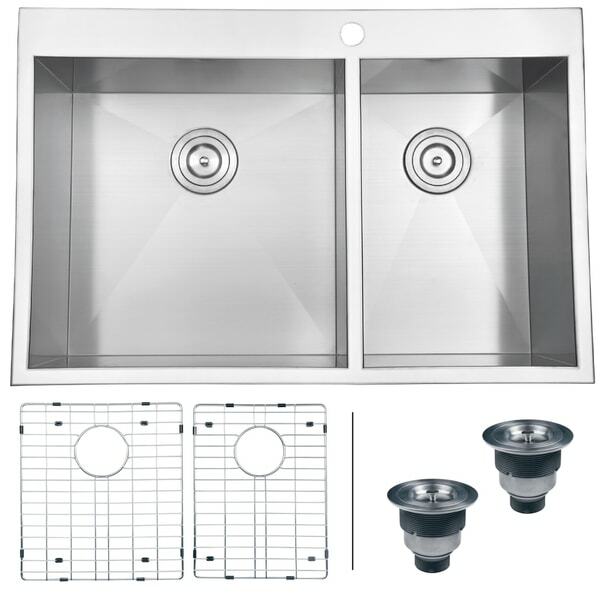 Overstock advertised a sink, two drains, and two grates to protect the bottom of the sink. The box contained everything but the grates. We contacted Overstock.com customer support and they said they didn't keep extra parts like that around. Since we didn't notice until after the sink was installed and the old one gone, we couldn't return the sink for a replacement. Since no grates were installed, the bottom of the sink has endured some superficial scratches, but nothing out of the ordinary for any Stainless Steel sink. I would absolutely recommend these sinks. Price:Quality is a no-brainer. I love this sink and definitely recommend it. It's stylish, pro-looking and just beautiful! The only reason why I took off a star is because of two minor drawbacks: 1. Hard to upkeep. Watermarks stain it very easily. I've had other stainless steel sinks in the past and those were not as hard to keep clean as this one is. 2. Ruvati doesn't make drains for garbage disposals. The drains that came with this sink are astonishing and it's a shame that I can only use one on one side, and then the regular, standard "insinkerator" on the garbage disposal side. I just completed a remodel of my kitchen, replacing my old sink with this Ruvati 16-gauge Stainless Steel/ 33 inch Double Bowl kitchen sink. It looks STUNNING!! I get compliments every time someone see's my kitchen, they comment on the beautiful sink. It is high quality and looks fabulous!! I definitely give this a 5 star rating! This sink is everything it was advertised to be. It is a zero radius sink so the plumber had to cut a into two of the corner braces of my 36" cabinet just a little to install it. He said the brackets were difficult and only used three of them. But he used LOTS of putty and the sink is going NOWHERE. It is a huge and beautiful sink. Heavy, no noise, very deep- I feel like I have a commercial kitchen now. I bought a Delta pull out faucet to go with it and cleaning the sink is a breeze. I think keeping it clean would be difficult with a regular faucet as you might constantly be having to move the drainage racks and wipe things down the sink. With a sprayer it is fast and easy. I put the disposal in the larger side and we rinse our dishes there and occasionally wash other items in the small side. I highly recommend this sink. I was looking for a solid, stainless steel sink for my kitchen. I like the quality and size of this sink. The bowls are very deep and the vertical sides leave a lot of interior space. The sink is very heavy being 16 gage. It may not be the style for every decor; but, I recommend it for those looking for a commercial look on a budget. I've had this sink installed about 6 months now and I love it! The heavy 16 gauge steel makes it feel very solid--not "tinny" sounding like some 18 or 20 gauge sinks. The cutout dimensions on the website were right on so my installation was very smooth. I love the look and feel of this sink--highly recommended! Ruvati - Wow what a beautiful sink! There are so many great things to say about this sink. It fits in a standard double sink hole. The gauge of the stainless steel makes it very rsisitant to dents. There are grates for both sides that helps with both washing and drying. There are debris catchers for both drains. We highly recommend this sink if you are looking to upgrade any kitchen. It is a whole new level of stainless steel sink! We love our new Ruvati stainless steel sink! It's made our kitchen look so updated and we love the large left bowl for drying and the right for washing, but you could do the opposite. It's a beautiful sink. Great product, very happy with it, I highly recommend this product. Very high quality. Much heavier than the big box stores offer and similar in price for their lesser quality sinks. Love the size of the sink, the racks that protect the bottom and its clean lines but it shows every drop of water! I assumed that Stainless meant that you did not have to wipe it down every time the water was turned on. Great industrial looking sink. The look I wanted for my newly renovated kitchen. Have had it 3+ years now. The pitch of this sink is awful. I have to use 10x the water to clean the corners and remove the food scraps. I would not recommend this sink, nor would I purchase it again. This was a terrific purchase. The sink is nice and deep and it is beautiful. I love that one side is slighter smaller than the other. It cleans up easily and I love the sink grates for protection against scratches. This was a great value !! Love this sink. It is beautiful, big enough to wash big pots in, and it just makes your kitchen look very modern and stylish. If your look is modern, go for it and buy this sink. You won't regret it. I really love the style and the finish of this sink. Looks wonderful in my kitchen remodel. I would recommend this sink to anyone looking for this style. "This states that this drop in sink has two holes. Is one for the faucet and one for soap? I'd like to see a photo of the two holes - can you email a picture of the two holes? Is there a phone number that I can use to actually speak with someone? MaryEllen"
it has the design i like with accessaries, and was in my budget. Reputation and product reviews, as well as the overall appearance. It's a beautiful sink! good customer reviews. correct size. like the 60/40 split size. needed two sides to accommodate disposal. "can a garbage disposer be hooked up and if so does it require a drain that can be locally purchased at any big box store?" Hello, dearjohn. Yes, you should be able to hook up a garbage disposer to this sink. I am not sure as to what kind of drain that would require, however. Thank you for your inquiry, and have a great day! "Is it possible for you to offer this sink with more holes for soap dispenser, hand lotion, etc? I would like 4 holes but don't have the confidence I or my husband could do it. We believe the 33x22 will fit in our existing granite cutout. Would have preferred the single bowl but I see that is only 33x21. Do you have the single bowl in 33x22? Sorry, there are two questions here: the holes for things like soap and can the single bowl come in 33x22. Thanks!" Thank you for contacting us, olympiaalison. Unfortunately, the single bowl (RVH8000) only comes in 33x21 size. We only offer the sink with 1 hole. However, you can contact a metal company in your area, and they should be able to punch the 3 extra holes that you need. To punch holes in stainless steel, you need special tools that only metal companies will have. I hope this helps. Please let us know if you have any further questions. "Hello, If the sink doesn't fit my pre existing cut out in the granite can I return it? Do you offer a recommended cut out size?" Hello fcovyeau, yes, you can return it. We recommend reading the return policy listed under the "Shipping and Returns" menu. Also, there is a diagram on the last image of the photo gallery that will give you the specs you need for a cut out. We hope this helps, and thank you for shopping with us. "I purchased this sink as a drop in and now I am thinking of installing granite and want to see if it is possible to use this as an undermount sink"
Hello sharins66, this is only designed to be an overmount sink. Thank you for shopping with us. I installed this sink in granite as a drop in without many problems a little tight to get the hold down clips in. "I am looking for a "tile-in" stainless steel sink. With the sharp corners on this sink I am thinking it may work. Can you please tell me how tall the lip is and if the lip is rounded or a flat edge. Thanks!" Hello this has a 1 inch lip that is flat edge, it is not a sharp edge however. I hope this is clear. Thank you for shopping with us.